This January, immerse yourselves into an interactive art experience involving theatre trickery and special effects. 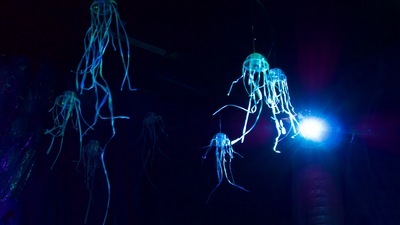 Beneath and Beyond takes you on a 4D adventure through underwater landscapes and alien worlds, all created out of recycled plastic. Formally presented at Carlton Courthouse with the support of La Mama Theatre, and elements of the installation presented as 'Beneath' at ArtPlay, this interactive experience earned a nomination for the best kids event at Melbourne Fringe. Enter an adventurous world connecting you through emotions and sensory exploration. Suited to all ages, Beneath and Beyond encourages you to watch fish float by whilte listening to the sounds of the universe. By using only recycling to create the world, Beneath and Beyond also leads visitors to think about the impact of waste on our environment. Beneath and Beyond is a production by Making Space, a collective of independent female theatre designers led by Bronwyn Pringle and Melanie Liertz. They create interactive and immersive design-based experiences that explore the relationship between the audience and the performance.Inviting the audience inside the performance. When: 10 - 21 January 2018. Various sessions.